There is a way to live life on earth in such a way that your eternity is guaranteed. God called Jesus the way, in fact Jesus is the original and only stairway to heaven! Many folks don't like the stairs. 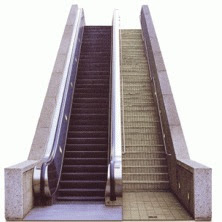 They look for easier ways...escalators, elevators...they move you upwards quicker. Spiritually speaking there are no fast-track ways into our eternity with God. No elevator ride to the pearly gates and no escalator to get you there by doing nothing. You and I must keep walking. Step by step, we find that each one represents another part of the walk we are taking with Christ. Think of each step as one good decision after another. Escalators can fail to work. (at our mall one of them is always broken!) elevators can get stuck. But you can always take the stairs! As you participate, and I hope you will, in your local church this weekend for Easter, remember that though the way seems narrow and hard at times, you can always take the stairs. Jesus said that if we would seek Him, we would surely find him. He promised to be with you and never leave you abandoned. He sent you a supporter in the Holy Spirit that can help guide you to the truth. This weekend, don't take the escalator and forget the elevator. Take the stairs!